Are you superstitious? do you think twice about black cats, walking under a ladder and not wanting to stay on the 13th floor because you think that the number 13 is unlucky? Very few players whether it be baseball, football, et all select 13 as their number because they think it is unlucky. But in fact, in Italy, 13 is generally considered a lucky number! I have a little black kitty in my life, well not so little actually. At one time I had not 1, but 2 black kitties, so you can tell that I for one am not superstitious! AlleyCat is all black, not a single white hair on that little body of hers. I live with black cats in more way than one. Black cats in my stitching, black cats in my jewelry, black cats in my clothes, well I think that you get the idea. Deco Kitty with that little black kitty sitting on the top of the column surveying her domain. That is so AlleyCat! I packed this up and sent it on it’s way yesterday. 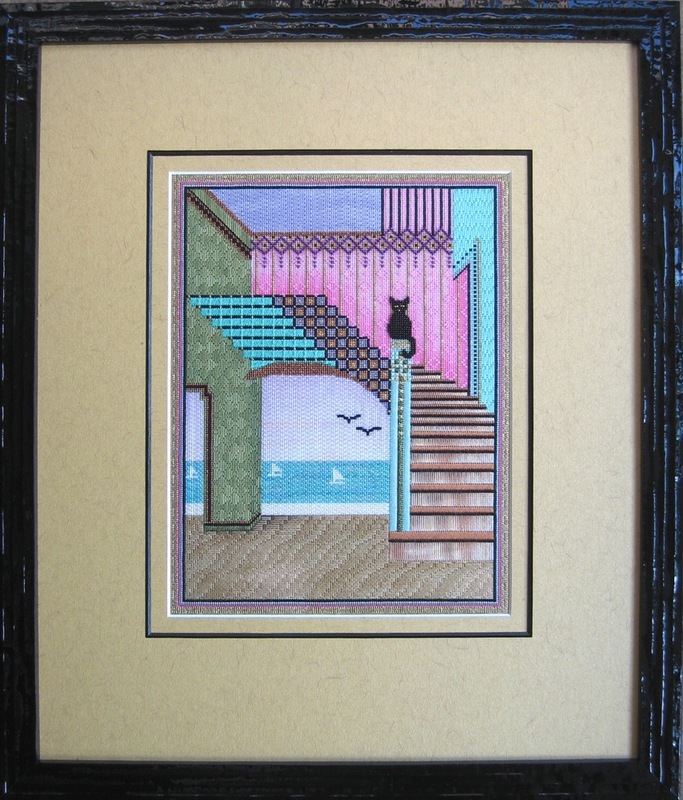 My framers did a purr~fect job framing my piece, but I am not sure I like what we picked. It had to be the gold mat as we tried purples, then greens, pinks, turquoise and browns… even though it would look good in one area closest to the color that it matched, it just didn’t look good all over. Once we narrowed it down to gold mat… it needed to be a special gold. A little black filet added some interest. We selected this black frame as it has a wet look, a wavy look to fit into the theme of the water. Now I anxiously await the notice of it’s safe arrival back east. I have been baseball withdrawals the last few days! The All~Star break was this week and they added an extra day off for the players this week. A much deserved extra day, but I am ready for some baseball! My team is on the road, but the MLB baseball package that I get, first pitch is only about 4 hours away! Am I out of control or what? Two more stitch guides to chart for the magazine will round out my day today. Elizabeth walked me through a little challenge that I was having with Illustrator as we gabbed the afternoon away. I head up there in 10 days and who’s counting? I can’t wait, not only to see her and everybody else…but to meet her 2 new standard poodle puppies! I am working on my list of Illustrator questions, you know those challenges that just frustrate the h*** out of me! 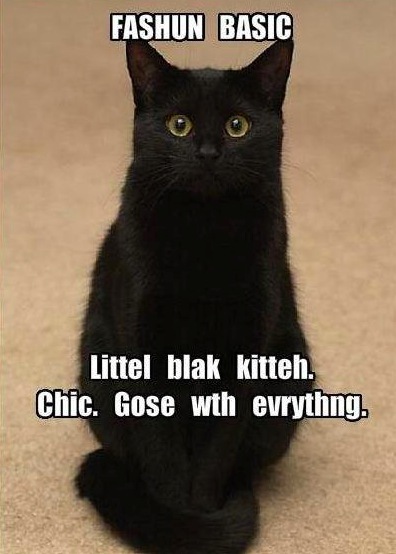 As the current owner of two black cats and one mostly black cats (the most recent in a line of many black cats), I want to point out that in England apparently black cats are considered lucky from what I hear. Hi Janet! you know when they decided that they are going to adopt you, I never question the fact that many think black kitties are unlucky! 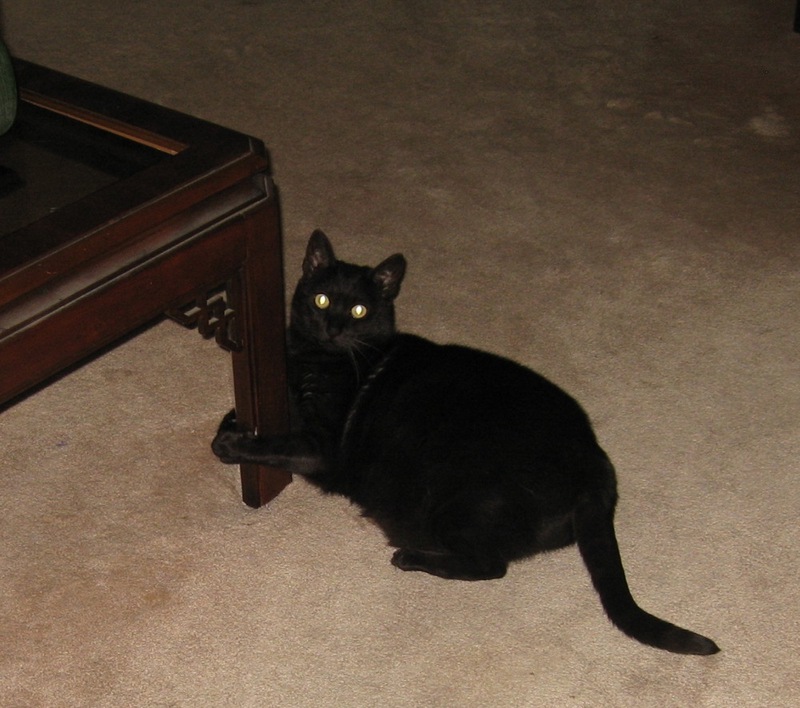 Alley Cat is not going to let anyone steal that table! Best wishes for another first-place ribbon…. Thanks K.B. That is the first time I have had a cat do that…and it’s usually about once a day too…Funny girl! I really like your framing on this piece. It’s a nice presentation, the mat/frame don’t compete with the absolutely amazing piece! I am not a fan of a mat/frame that stands out in front of your stitching. And this piece is simple lines, amazing threads, doesn’t need flash to make it wonderful. Yes,I love kitties too! Thanks so much Dee! I think we always 2nd guess ourselves!